Teams are shifting more often; they're shifting not only at higher rates against the usual slow-footed, southpaw sluggers who are classic shift candidates, but also against more marginal hitters whom they wouldn't have bothered to defend before, down to and including Ryan Flaherty; the math suggests that it makes sense for an average hitter to attempt a bunt with third base open as long as he has a >=40 percent chance to get it down; and the more common the shift is, the more worthwhile it becomes for a hitter who hasn't had to do it before to invest the time necessary to become a competent bunter (as extreme pull hitter Brandon Moss did this spring). More and more teams are getting on the defensive positioning bandwagon. At some point, the batters will strike back, using one of the only anti-shift tactics available. Inside Edge tracks defensive shifts and bunts with the shift in effect, so they’ll be supplying the data for this series. According to IE, there were 40 bunts against the shift in 2012, and 50 in 2013. Of those 90 bunts, 56 led to hits, so you can see why the bunt is so smart: At that success rate, it makes sense for any hitter who can get a bunt down to do so with the bases empty, and the worse the hitter and the emptier the left side of the infield, the better a play it becomes. And now you’re caught up. Today we’ll cover the games of May 22–28 (which means that we’ll get to that Lucas Duda bunt from Thursday next week). As always, the list of bunts comes courtesy of Inside Edge. I have only two new bunts against the shift to show you this week, which works out well, since we have a few other things to cover: an excerpt from an interview with with Athletics bench coach Chip Hale, some fascinating work from Chris Mosch on a new trend in shifting, and (most exciting of all!) some video of Ted Williams bunting to beat the shift. Let’s get started. This probably wasn’t quite the bunted ball trajectory Joyce envisioned, but even so, it took a fine play by Brock Holt to beat him by half a step. Rizzo was the hero of last Friday’s edition after beating the shift with bunts twice in one game (more on that below), but he couldn’t repeat the feat this week. San Diego left him plenty of real estate to work with, but he didn’t get the ball far over enough. Recently, Inside Edge reconfigured their software to allow the recording of attempted and threatened bunts to beat the shift in addition to those that were actually put in play. This is obviously pretty important; as many of you have pointed out, looking at how often bunts against the shift in fair territory result in hits tells us something, but the rate at which hitters fail to get the bunt down is also an important part of the picture. Yes, players are batting .625 when they drop a bunt down against the shift so far this season, which would seem to make bunting a no-brainer, but to say so for sure, we need to determine how often attempts come up empty. To that effect, here’s the latest list of threatened/attempted bunts from the past week that led to fouls or taken balls or strikes. Eventually, we’ll have a large enough sample to say something about how often bunt attempts give birth to bunts. I linked above to a story about Brandon Moss, who learned to bunt more or less from scratch this spring in an effort to defeat the shift. Moss has given much of the credit for picking up the technique so quickly to A’s bench coach Chip Hale. During a longer conversation earlier this week, I asked Hale about the ease of bunting (and batting) to beat the shift. Ben Lindbergh: Is [learning to bunt] something that you think that any player can do if they put the appropriate time in, and have the desire to do it? Or does it take a certain skill set to do it? Chip Hale: No, you just need to practice it. I mean, these guys are all good athletes. They have good hand-eye coordination, and if they’re willing to give it a shot, I think they can do it. Brandon worked in spring training—it wasn’t like we had bunting practice with him every morning. He just did it. And we talked about it more than we really did it, just with his form, not to be too much in a hurry. I do think any player can do it, and I do think that the game has obviously changed with all these shifts. And it’s not going to get any different until the guys either—with handling the bat, with bat control, or pushing a few bunts—these guys are going to stay in these shifts and take away balls that we were always taught growing up were supposed to be hits. You know, we were taught as kids to hit the ball back to the pitcher, back through the box. We thought that was a good job of hitting. But most of the time now, if you hit the ball back through the pitcher’s box, there’s somebody standing right behind second base. So, we’re either going to have to recreate how we hit as kids, or we’re going to have to learn how to take mistake pitches and hit them where the shift is not. If you watch some of the great hitters in the game—Miguel Cabrera, Albert Pujols—when you shift them in certain situations, they will take those hits in those spots for RBIs and getting on base. So these guys, the great ones, have already proven they can beat these things if they want to. Ben: There’s been a lot of talk about how many players actually have the ability to do that, whereas it seems like bunting is something that, theoretically, everyone could do if they put the time in. 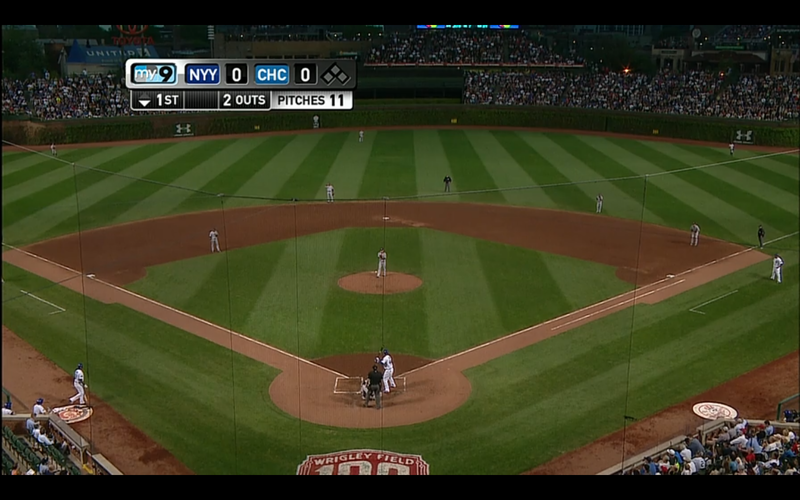 Chip: Alex Avila, in fact, did it, bunted, and Sonny Gray popped off the mound and got him out. We were in a shift. You have to know who’s pitching—there’s some great athletes on the mound that’ll cover that side. But that doesn’t mean you can’t hit a ball that’s middle-away and hit a ground ball where they’re not playing. It’s just something that’s going to have to be a mindset in the future of whether it’s player development, and whether we take BP, and whether setting nets up or putting people out there, getting guys used to being in those spots. Listen, we’ve grown up since Little League with people in certain positions, and whether you think you do or not, you learn to hit away from those positions as best you can. But it’s just going to be a change in the game. That’s the great thing about the game. People are pushing the envelope and saying, “Hey, I’m not going to give this hit in the hole to these big old lefties and I’m going to take away the middle of the field,” probably. It’s smart. It’s smart baseball. After Rizzo beat the shift during his first two at-bats on May 15, the Cardinals finally got the message. Nearly every opposing broadcast during the ensuing series talked about Rizzo’s two-bunt day against the Cardinals, and teams likewise recognized the threat of him bunting to beat the shift. The Brewers and Giants both kept their third baseman closer to the line than you typically see with an overshift against a lefty, while the Yankees actually abandoned the full overshift that they had used against Rizzo earlier this season. Instead, they had their third baseman, shortstop, and second baseman all heavily shaded. The Padres defended against Rizzo’s threat to bunt during his first handful of trips to the plate of their four-game series last weekend. 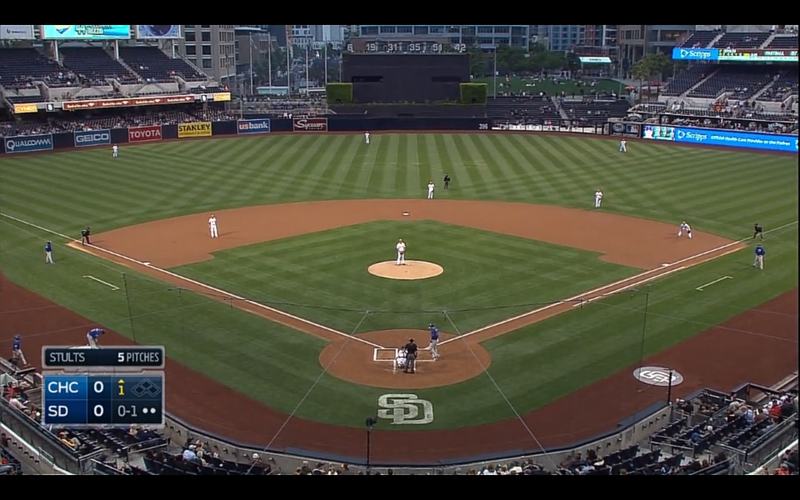 But unlike the Brewers, Yankees, and Giants, San Diego ditched the strategy before the series was over. During Saturday’s contest, the Padres went back to a full overshift that positioned Chase Headley where the shortstop normally stands, and Rizzo proceeded to lay down a bunt during his fourth at-bat (which you saw in Ben’s section earlier). The Padres were able to retire Rizzo on that bunt attempt and were perfectly content with letting their former first baseman of the future try his luck again in the fourth game of the series. 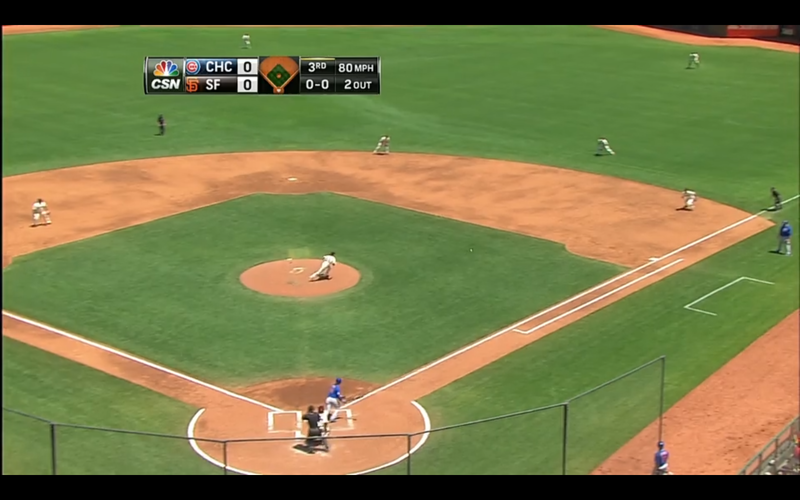 During Rizzo’s first at-bat on Sunday, he showed bunt and pulled back for ball one. The Padres didn’t budge. 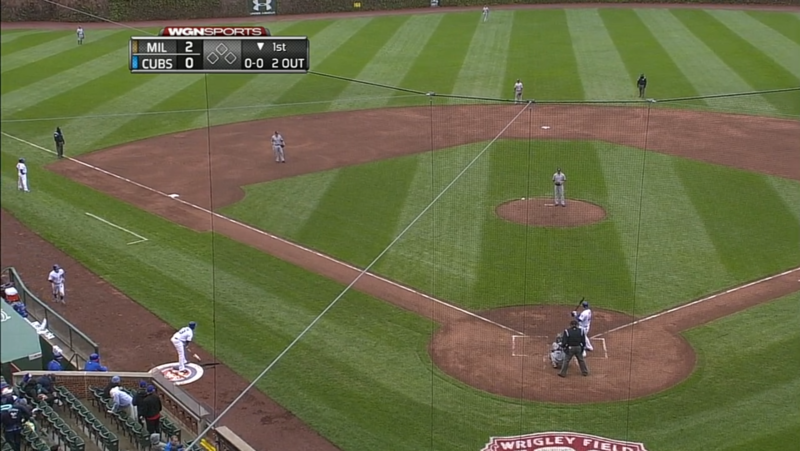 Rizzo tried again with a 1-1 count, but the bunt went foul, and he swung through the next pitch for strike three. Despite Moreland failing to reach base the first time that he actually laid down a bunt against the shift, the Blue Jays took no risks the next time he came to bat—even with Buehrle still on the mound. As you might remember, Solarte successfully beat the shift with a bunt in the ninth inning against the Cubs on May 20. Unfortunately, we didn’t get much of an idea about how the Cubs would react. Solarte had just one at-bat as a lefty with the bases empty the next day, and neither broadcast showed Chicago’s defensive alignment prior to a two-strike count. When Seager attempted his bunt hit in the second inning on May 20, the Rangers had three infielders to the right of second base. This wasn’t the case the next time Seager came to bat with the bases empty. However, Adrian Beltre actually wasn’t positioned all that differently than he was when he made an incredible barehanded play to deny Seager a bunt single. Having a third baseman who can make plays like that affords a team the luxury of being able to heavily shade all of their infielders while still defending against the bunt. Throughout this series, the data presented has looked exclusively at bunts intended to beat the shift. But last weekend, I noticed a sequence of two-strike-only shifts against a trio of hitters who have been notorious for their ability to get on by way of the bunt. Inside Edge reports that this past weekend was the first time that any of the three speedsters has ever had a full overshift used against them, so this appears to be a new breed of defensive shift. In the third inning of last Friday’s game against the Indians, Bourn faced off against Bud Norris. Manny Machado and J.J. Hardy were each slightly shaded to their left, but Baltimore’s infield was otherwise playing straightaway. With Bourn staring down the first full overshift used against him, he laced Norris’ offering over the shift into center field for a single. In the past, Bourn hasn’t struck opposing teams as a shift candidate, but it’s certainly not because of his hit tendencies. His spray chart below shows a heavy diet of ground balls hit to the right side of the infield, and the majority of the grounders hit to the left side are within range of where Machado was positioned during the full shift from earlier. Bourn has 67 bunt base hits since his first full season in 2007, so while his spray chart suggests that he would be a prime candidate for a full overshift, his threat to lay down a bunt is an obvious drawback for opposing defenses. If not for Bourn’s speed and bunting prowess, Baltimore would likely have shifted him as soon as he stepped into the batter’s box. Instead, they settled for defending against his spray chart once the bunt was no longer an option (or at least one with a much higher cost for Bourn). This pattern continued over the weekend, as the Orioles implemented a two-strike shift during Bourn’s first trip to the plate on Saturday, and three more times on Sunday. Below are screenshots of Baltimore’s shift against Bourn, with the defensive alignment early in the count and their positioning with two strikes (scroll over the count to see the defensive alignment). Pittsburgh established itself last season as a shift-savvy team, and this weekend, they implemented two-strike shifts against a pair of Nationals hitters who have proved that they can lay down a bunt. Denard Span—who has 29 career bunt hits—stepped in for his second at-bat on Sunday with a traditional defensive alignment playing behind Francisco Liriano. Span bunted the southpaw’s first offering foul. The same sequence occurred during Span’s next at-bat. You can see Jordy Mercer to the left of second base early in the count, but a full overshift is in place when Span singles to right field on a 3-2 pitch from Liriano. These were the only two times the Pirates shifted against Span during the series, perhaps because they liked Span to pull the ball either in his specific matchup against Liriano, or against lefties in general (his other five two-strike plate appearances during the series came against Edinson Volquez, Charlie Morton, and Mark Melancon). Span’s spray charts with two strikes against righties and lefties suggest that the reason may have been the former, as no stark difference based on handedness stands out between them. Going forward, Span is probably less of a two-strike shift candidate than Bourn, as he tends to spray the ball the opposite way slightly more often. Espinosa and Dee Gordon are currently tied atop this season’s bunt hit leaderboard with six apiece, and Espinosa has ­­24 bunt hits in four career seasons with the Nationals. 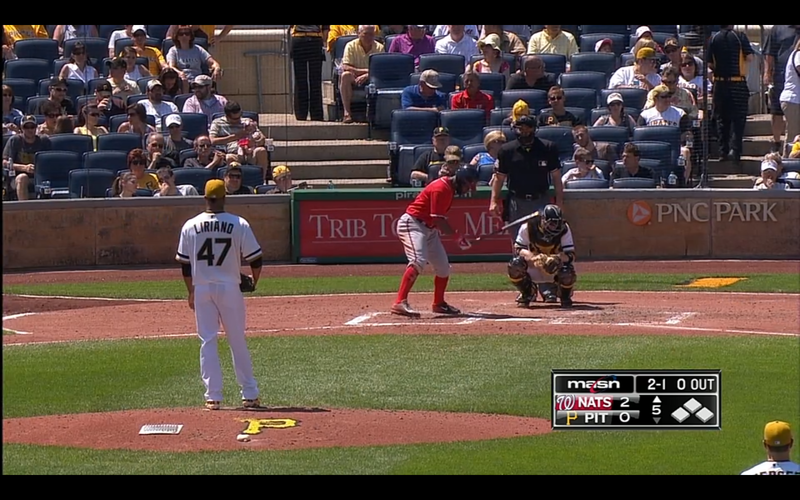 During his second at-bat last Thursday, Espinosa squared around to bunt on each of the first two pitches from Volquez. 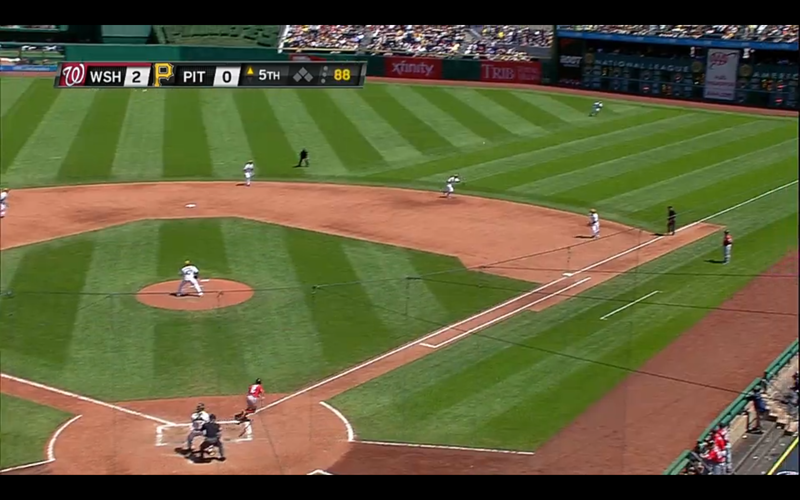 The bases were empty, and Pittsburgh was using a fairly standard infield defense. 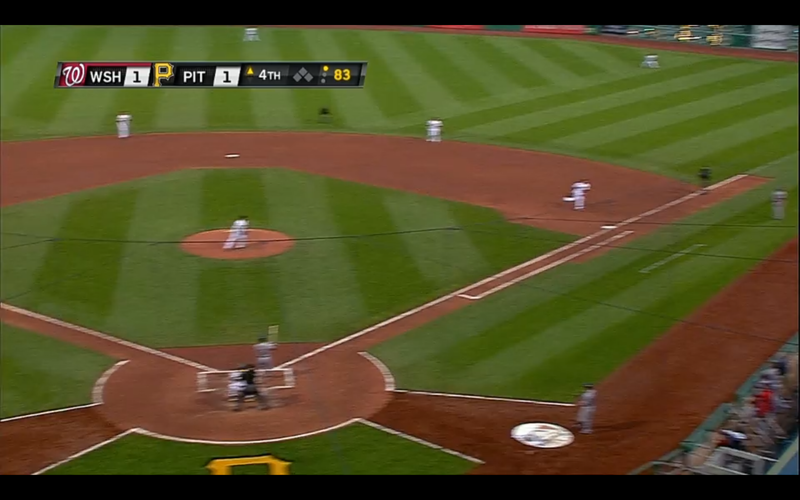 However, with a 2-2 count, the MASN broadcast showed that the Pirates had radically repositioned their infielders. The most reasonable assumption here is that Pittsburgh was so concerned about Espinosa bunting that they waited until after he swung at Gomez’s first 0-2 offering before deciding it was safe to implement the full overshift. If that assumption is correct, the logic by the Pirates isn’t perfectly sound; if they were that worried about Espinosa bunting for a hit with two strikes, swinging at the first 0-2 pitch shouldn’t have ruled out the possibility of him trying for a bunt hit on the next pitch—especially since the entire left side of the infield was subsequently open. Regardless, the fear of a bunt does seem like the most rational explanation for the sequence of events. Thanks to Nick Bacarella for transcription help and to Nick Wheatley-Schaller for image-making assistance. Great stuff as always. Maybe my favorite article to read each week. More of the beauty of the game and this article illustrates it with grace and precision.